Sewer Line Inspection and Cleaning Edmonton | Canessco Services Inc. If you have worn out or damaged sewer pipes that are preventing your business from being as efficient as possible, you could have some serious problems. Not only do damaged pipes collect more debris, making them more difficult to clean, but the added dirt and minerals can lead to a blockage over time. In some instances, the pipe may even burst, damaging your property and disrupting your business’ productivity — not to mention making the property unsanitary. With a sewer line inspection, Edmonton businesses can avoid further damage to their pipes. You have a great choice with Canessco Services Inc.—we use state-of-the-art equipment to pump out and clean your sewer line without risking additional damage. Thus, when you hire our team to perform an inspection, we can help you determine the best way to perform your sewer line cleaning at your Edmonton business. Pipes often become clogged with dirt and rubble, causing blockages and other problems. Using high-pressure water for sewer line cleaning in Edmonton allows your pipes to be restored to their original or like-new condition, which can lengthen their lifespan. With this service, we have the capability to flush all types of debris from your pipes, including grease, soap scum, and scale. Keeping phone lines, gas lines, and electrical lines clean is important. Accessing these utilities without causing damage can be difficult, but hydro excavation uses pressurized water to break up the interfering soil without damaging the lines. Pinpointing an exact problem, such as a break in a sewer line or tree root blockage, can often be difficult due to the location of the problem. When Canessco Services Inc. performs a CCTV inspection, we use cameras to locate problems in pipes’ hardest-to-see places. If you are hearing gurgling noises from your drains or your toilets are slow to drain or overflowing, it may be time to call Canessco Services Inc. for a sewer line inspection. Our team can not only complete a thorough sewer line inspection, but will provide you with a written report detailing the condition of your pipes, as well as a DVD to document the issues we’ve uncovered. We are PACP certified through NASSCO. If you have liquid waste that needs to go, this service will take it away for you. Using vacuum trucks, we’ll suction liquids from your site and dispose of them at approved sites. We use this technique to pump water out of catch basins in parking lots. This helps keep the lots clean and less likely to have problems when it rains or the snow begins to melt. Homes and businesses have pipes and drains of all sizes in their sewer systems. For smaller pipes, our small sewer line cleaning in Edmonton provides equipment that is capable of cleaning and maintaining pipes from sizes 1.5” to 4”. Restaurant owners who need grease trap cleaning in Edmonton are among the people who can really benefit from this service. If you own a restaurant, the grease traps in your kitchen need regular maintenance. Contact us about this service when you want to avoid unpleasant odours and backups. Canessco Services Inc. specializes in confined space entry cleaning. All our employees are highly trained in confined space entry cleaning and we meet all industry standards when it comes to safety. We will and have entered many different types of confined spaces. The solution to your drain problems is just a phone call away. Contact us for all your sewer service needs. 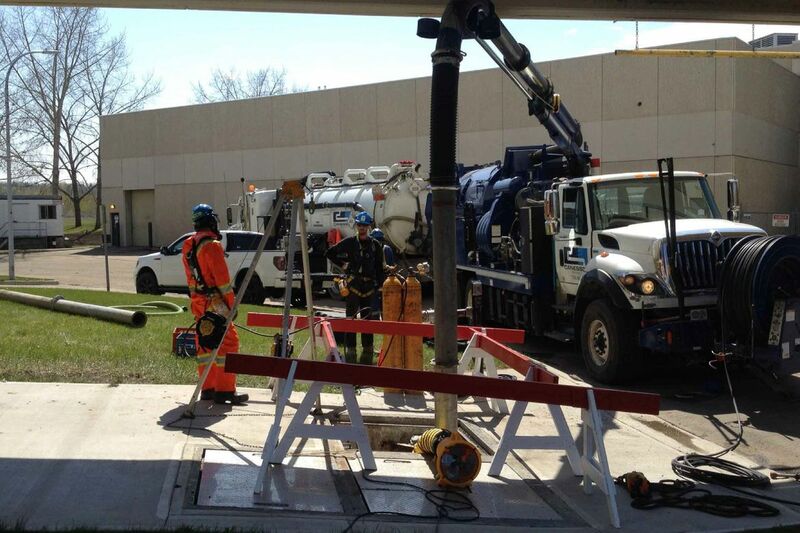 We’ve worked on all types of liquid waste and sewer cleaning services.